Santa Fe artist Armond Lara and his collaborator Joseph Riggs discuss the story behind the Flying Blue Buffalo installation on Saturday, August 18, 2-3 pm. The monumental art installation, comprising 77 winged buffalo sculptures, tells the centuries-long story of enslaved Native American children. Inspired by his own family history, Lara dreamed up the winged buffalo as a new symbol of Native survival and resilience. Thursday, August 16, 5:30-6:30 pm | RSVP on Facebook. Opening Reception: Friday, August 17, 5-7 pm | RSVP on Facebook. Artist Talk: Saturday, August 18, 2-3 pm | RSVP on Facebook. Closing Reception: Saturday, November 17, 5-7 pm | RSVP on Facebook. Join Jaydan Moore for an artist talk at form & concept on Saturday, June 30 from 2 to 3 pm. He discusses his solo exhibition Dust, featuring sculptures made from found, silver-plated tableware, and intaglio prints. Moore appears at the artist talk on Saturday, June 30 from 2 to 3 pm. The show opens with a reception on Friday, June 29, 5 to 7 pm. Moore comes from a long line of California tombstone carvers, which might explain his obsession with the concept of commemoration. “The trade goes back four generations,” says the Virginia artist. “I grew up watching people make accommodations for loved ones, and turn their history into an object.” About six years ago, Moore began collecting silver-plated tableware to use as a raw material for intricate sculptures. By reshaping these culturally loaded objects, he turned them into vessels for his ideas about memory and material culture. In a new solo exhibition at form & concept, Moore manipulates scrap metal from previous artistic experiments to flip his conceptual universe on its head. “What are the stages of forgetting?” he asks. Virginia artist Jaydan Moore is known for his sculptures made from found, silver-plated tableware. After six years of manipulating these lost heirlooms to reflect on memory and commemoration, he’s accumulated thousands of scrap metal fragments. In his solo exhibition Dust, Moore incorporates the shards into a new series of sculptures. Through these palimpsests and an array of intaglio prints, the artist explores the slow deterioration of memory. Dust opens on Friday, June 29 from 5 to 7 pm, with an artist talk on Saturday, June 30 from 2 to 3 pm. Matthew Szösz’s Minimal Tension exhibition might be over, but his glass sculptures are still on view across our ground floor. While the Seattle-based artist was in Santa Fe for his show, we interviewed him about his artistic process and career. He discussed his Inflatables and Ropework series, which figured prominently into the exhibition. Watch the video above to learn more about Szösz, and browse all of his available artwork in the form & concept collection. Santa Fe sculptor Debra Baxter presents a new series of sculptural artworks in her solo exhibition, Tooth & Nail. The show opened on April 27, 2018. Baxter will appear at an artist talk on Saturday, May 19, 2-3 pm, and a closing reception on Saturday, June 15, 5-7 pm. On a studio visit this winter, she talked about her work as a sculptor and jeweler, her influences, and the new body of work. You moved to Santa Fe from Seattle almost three years ago. How has your practice changed since you got here? I feel really happy here, and solid. That solidity and happiness and the sunshine all make a massive difference in my joy. I feel like there might be more levity and light in me that might come out in the work. 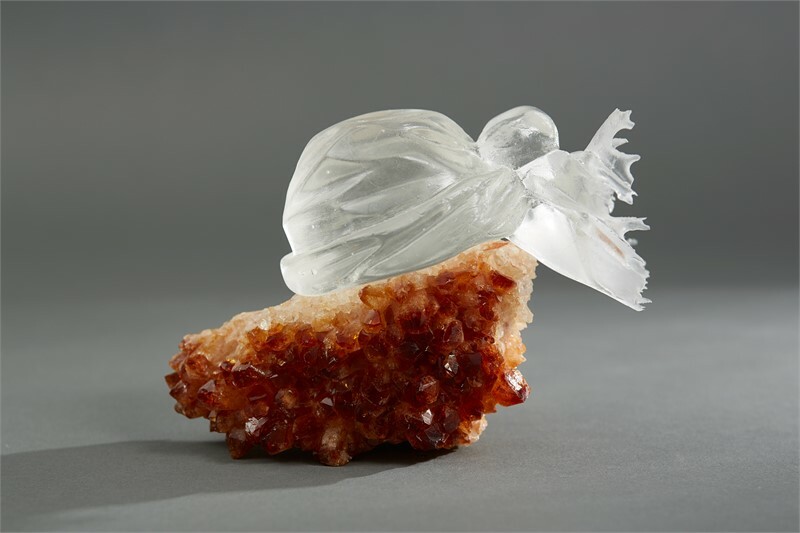 Debra Baxter, Face Down About to Get Up and Fight, cast glass, citrine 4.5 x 5 x 3 in. That makes sense. It seems like part of your practice is about bringing your emotional world into the third dimension. A good example of that is this idea of attachment. My husband is a woodworker. In order to make the things connect correctly, they have to both be flat. There’s a level of detail that’s insane that he’s really good at and can advise me about. In an emotional sense, I feel like I’m looking for a secure attachment and I almost get too attached to people and things. The thing about attachment is that you try to control it. That’s when it gets dangerous, when you’re trying to control someone else or the relationship. I made a sculpture once that was called It’ll Stop Screaming if You Let Go of It. Sculpting seems like a good way to work through those feelings. You’re constantly picking up new materials and swapping and combining and dropping them. Yeah, I’m always trying to figure out new, different materials. I’m trying to manipulate them, to figure out the edges of what I can control and what I can’t. It’s about realizing that sometimes you can only control so much, and after that you have to let it be what it is. 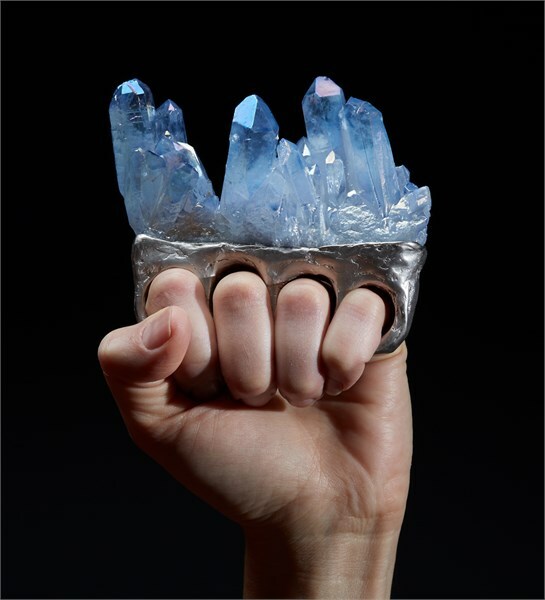 Debra Baxter, Aqua Aura Knuckles, bronze, crystal quartz, 4 x 4.5 x 2 in. Does your work as a jeweler help you take bigger risks as a sculptor? The processes definitely influence each other. I use sculpture processes on my jewelry—like using an angle grinder to grind things, which no one in their right mind would do. On the flip side, If I took some of my sculptural stuff to a jewelry caster, they would probably say, “That’s way too big! That’s not going to happen!” The possibilities open up a lot more, the more processes you learn. The reason I got interested in jewelry, as much as I wanted to make jewelry, had to do with the fact that certain objects are more powerful on the body. Your body brings a certain power to it. With the crystal brass knuckles series, it’s so much more powerful on the hand. In addition to jewelry and adornment, you’ve recently taken a big interest in drapery. I’m really interested in the history of drapery in art. It’s such a weird ancient practice, to draw drapery. Sculptors have been carving drapery out of stone forever. It made me wonder how else I could translate fiber into other materials, like the bronze throwing stars that are cast from lace. 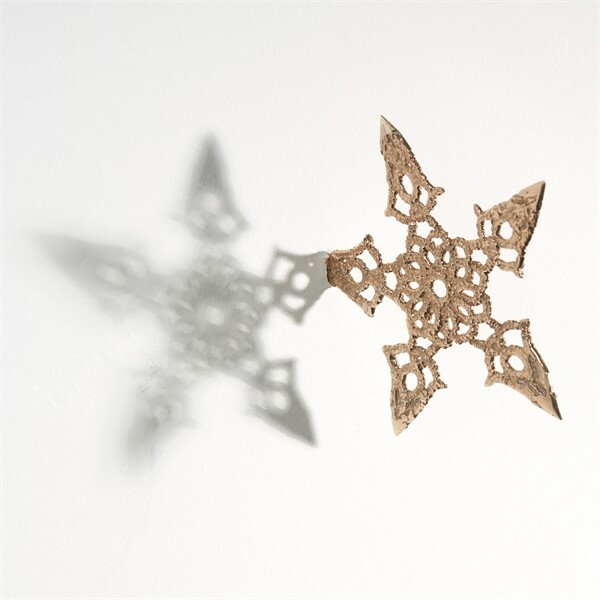 Debra Baxter, Lace Throwing Star, bronze, 5 x 5 in. How does all of this play into your solo exhibition, Tooth & Nail? I’m doing a lot of inversion in the show. It’s about the relationship and the tension between two objects. Sometimes they’re almost touching, but not. I’ve been thinking a lot about how can art be transformational. That’s a hard thing to control. Maybe my art can give other people power to make their art. I love that idea, that your power is giving other people power. Again, it’s about letting go. Debra Baxter, Together, cast glass, fluorite, 4.5 x 7 x 2 in. Click here to browse all of the artwork in Tooth & Nail. The Santa Fe artist has depicted buffalo in his drawings, paintings, and sculptures for decades. In recent years, they’ve turned blue and sprouted wings. Armond combined the buffalo with the symbol of the “lost bluebirds,” a term the Pueblo people called the millions of Native children who were abducted and enslaved as household servants and field-hands. This August, Armond will collaborate with form & concept to fulfill his long-held dream of creating a monumental installation of flying blue buffalo sculpture that explores this little-told history. A Kickstarter campaign will raise funds to support the production of over seventy 3D printed buffalo, based on a series of wood carvings by Lara. Visit flyingbluebuffalo.com to learn more. RSVP for the Kickstarter Launch. RSVP for the Open House and Panel Discussion. Wookjae Maeng, Balance- Lion B, stoneware, 14.5 x 9.8 x 10.6 in. Some animals are presented like hunting trophies, while other sculptures highlight the invisibility of the animal world to the human eye. All of Maeng’s animals have golden eyes that confront the viewer. 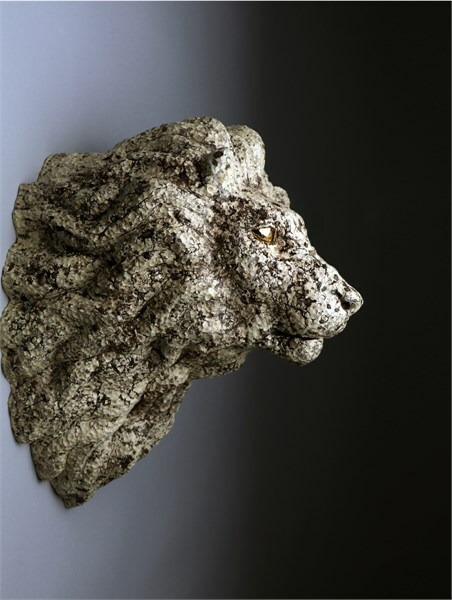 Maeng’s wall-mounted portraits of deer, rhinos, lions, and bighorn sheep, beautifully rendered in porcelain, call our attention to animals brought to the brink of extinction and crises in biodiversity. Hung in a trophy-like manner, they also underscore the separation between humankind and the rest of the animal kingdom. Read the rest of the blurb here, and make sure to swing by the opening reception on Friday, October 27 from 5-7 pm. Make sure to RSVP on Facebook to show your support! 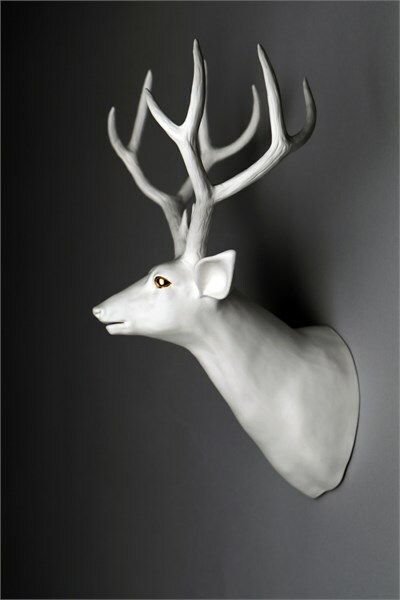 Wookjae Maeng, Balance- Deer A, porcelain, 12 x 7.9 x 7 in. 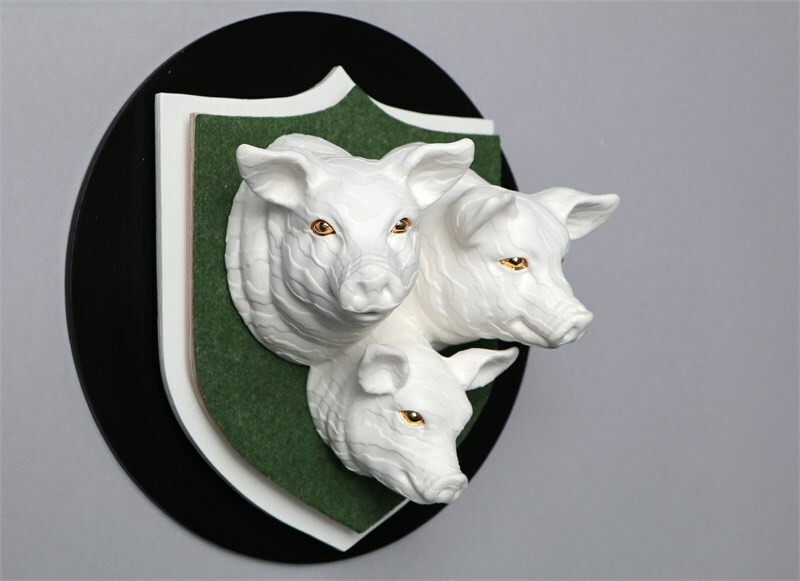 Wookjae Maeng, Happy Pigs- A, porcelain, wood, felt, 7.7 x 7.7 x 4 in. 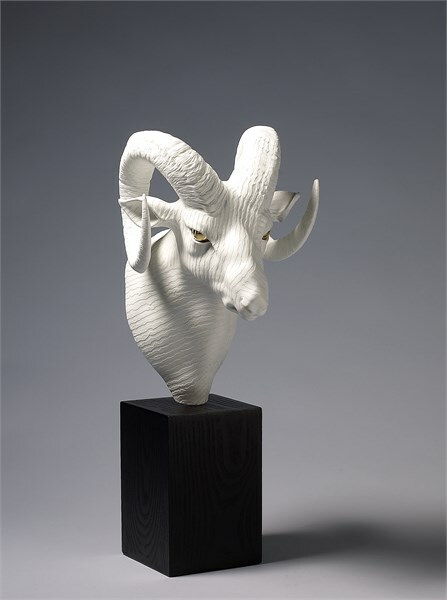 Wookjae Maeng, Adaptation #03- Big Horn Sheep, porcelain, wood, 18.87 x 11.62 x 8.37 in. Heather Bradley‘s new art installation, innominate, is a centerpiece of our One-Year Anniversary Exhibition. Heather perched red and white pottery on small shelves that span a 30-foot stretch of wall. Between the vessels are sheets of porcelain with diary entries scrawled on them, and words painted directly on the wall in elegant cursive. The words hint at innominate‘s deeply personal story arc: “body,” “wound,” “heal” and “scar” are among them. The pottery is titled after the human body as well, with three distinct series dubbed Arterial, Spinal and Handheld. Heather was inspired to write a new artist statement after completing the series. Read her words below, and keep your eye out for a forthcoming video and blog post that explores the story behind innominate. My hands have been in clay now for 22 years. They’ve grown more and more adept at predicting the behavior of the clay and manipulating it into the forms I want. Now, my hands are also essential to my job. I recently received my license as a massage therapist, and this new endeavor has been making me think of my ceramic work in a whole new light. I think of my pots as frozen moments in time, almost literally. The clay goes from a sloppy wet, flowing substance to a dry, solid, more permanent object so quickly. Whatever I bring to the potter’s wheel on any given day is materialized into the work. The way in which I approach a massage table is very similar to the way in which I approach my potter’s wheel. I must be very conscious of my own mental state, my thoughts, and my own body when giving a massage. I must watch my breath, be super-attentive to the placement of my fingers, and the angle of my neck when giving massage. My experience as a massage therapist has begun informing my art work in various ways. I find myself thinking of the necks of pots as vertebral columns, wedging the clay using the body mechanics I was taught in deep tissue class, and using my palpation skills to find air bubbles and imperfections. Most significantly, being a massage therapist has taught me more about proprioception – the awareness of one’s own body, one’s own sense of how they occupy space. I’m now approaching my clay with a greater sense of self, my body, and in particular, my hands, and what they can feel. I believe the more and more I can truly be present and embodied, the more the work will flow honestly through me and carry a sense of the moment in which it was created. Click here to browse all of Heather’s work on our website, and make sure to come see her innominate installation. It’s on view through October 22, as part of our One-Year Anniversary Exhibition. Stay tuned for a studio visit video and blog, where Heather will reveal her inspiration for the innominate series. Move over, hammer and chisel. NoiseFold’s sculpture installation at form & concept was generated in the digital world, and forged in the legendary glass studio of Dale Chihuly. Transdisciplinary artists Cory Metcalf and David Stout, who collaborate under the name NoiseFold, are known for combining visual art, music and interactive cinema into artworks that manipulate the senses and stretch the imagination. The centerpiece of their exhibition, a series of blown glass forms titled Metamorph, emerged from an unexpected project with master glass artists. Metcalf and Stout will speak about their installation at an artist talk on Saturday, June 17 from 2-3 pm. Meet Cory and David of NoiseFold at our latest Summer Artist Talk this Saturday, June 17, 2-3 pm. Click here to learn more about their exhibition at form & concept.